Two months after moving in, while the hubs was at work, I got busy and started removing the wallpaper. (against his advice of course!) Can you imagine what I found beneath the wallpaper? The plaster on one of the walls was completely destroyed (water damage)! Of course, I wanted to cry but I'm not sure whether it was because of the wall or because I knew my husband was going to be angry. Can you say, "Lucy, you got some 'splaining to do!" My sisters and I then took to painting the walls. I went with a color from Home Depot called "Simmering Cider". To be honest, it's orange. It was a shock at first especially because I was coming from an all white-walled home. We immediately loved the color anyway, albeit bold. Over the years, so much has changed in this room...the sofas, the end tables, coffee tables, entertainment centers, area rugs, etc. I still remained true to my orange walls though. Honestly, I still love them even now. 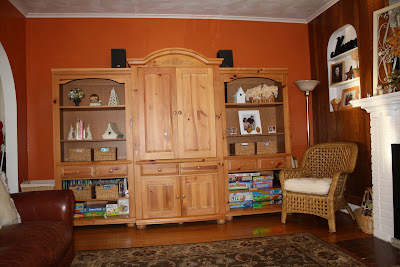 However, the one thing I do not love and have never loved in this room is that one darn paneled wall! You see, after the big "plaster disaster" there was no way my husband was going to let me remove the paneled wall, so I've had to live with it. Believe me when I tell you, I tried and tried and tried to convince him to remove this paneling, but he stood firm, knowing all too well what most likely lies behind it...more trouble. After almost 10 years, I recently decided I would throw in the towel and paint that darn paneled wall. I never wanted to paint it before because I thought that painting it orange like the rest of the room would make the cream colored fireplace stick out like a sore thumb. The decision was then made that I would rid myself of my favorite orange walls so that I could rid myself of that darn paneling. Off to Home Depot I went, in search of a paint chips most likely in the beige family. Several days later however, hubs was watching a home improvement show and whoever it was, said if you have paneling and want to get rid of it, do it the right way and take it down, don't paint over it. Oh how I wish I could send that person a letter of thanks because that's all it took. After 10 years of uneventful persuasion, that's all my husband needed was a few sentences from a home improvement guy to get him to waiver. He actually said we can take the paneling down! Now I realize this room doesn't look very cottage-y and I love cottage style, so of course that's sort of a problem. 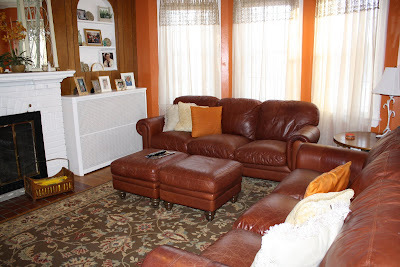 Do you agree that painting the wall orange like the rest will be an eyesore where the fireplace is concerned? 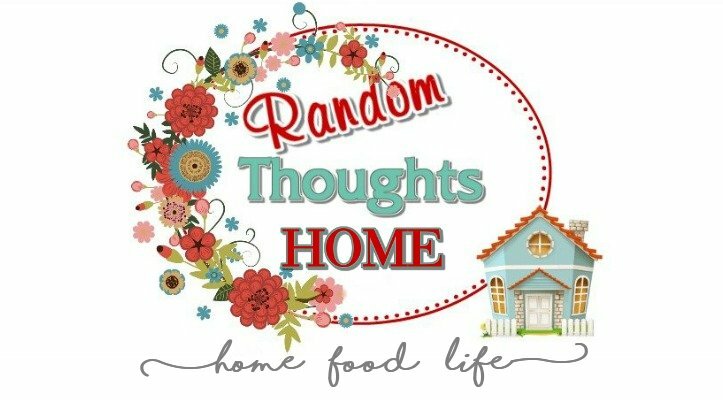 Any ideas you'd like to share or thoughts? 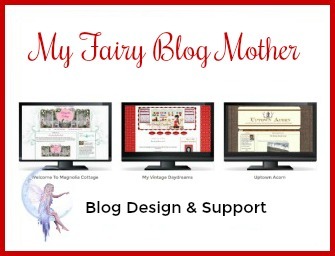 I appreciate anything you might want to suggest. Thanks! Hey girl I am in upper Michigan today so only have my Blackberry but can't wait to look at your photos on my laptop when we get home maybe I can give you some idea. Don't hate me, but I actually really like the wood paneling with the orange walls. With the addition of the leather sofas, I think it is really warm and almost 'lodge-ish'. However, I do believe that if you kept the orange the fireplace would stick out quite a bit. Maybe thats not exactly a bad thing. 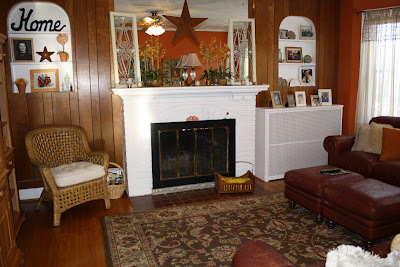 Could the white fireplace be toned down to a creme pallete, or perhaps keeping one wall that vibrant orange and going a few shades lighter in the same tone for the other walls to open up the space and not let the fireplace stick out so much. I dunno. You have way better taste than I do! I'm back home now so I am looking at your pics. Okay, first of all, I don't agree with you that it's not cottagey. 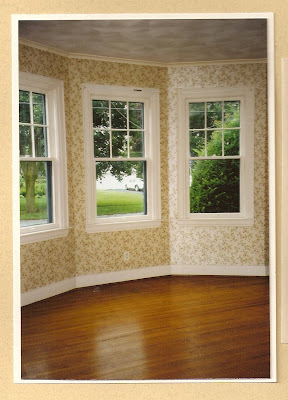 I think the room has a great cottage style, cottage style is not always white and pale colors. You've got your wicker in there for texture. Have you ever thought of a printed curtain for a little whimsey? Also, I think the fireplace would pop on an orange wall. 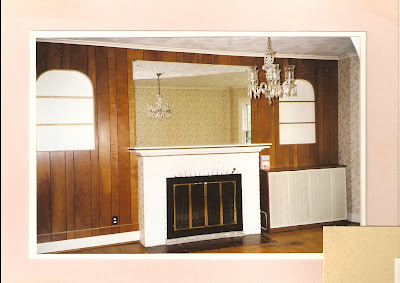 I'm not a fan of paneling so if your husband is willing to take it down, I say go for it. I think if you paint the room a neutral, it will lose its pizazz, especially you still like the color. Anyway, I'm going to email you cuz this is getting too long. I actually think that the orange wall would be amazing all the way around the room. I do think that the fireplace would pop but I think that would be a good thing. It could be a beautiful focal point. Love your furniture by the way. 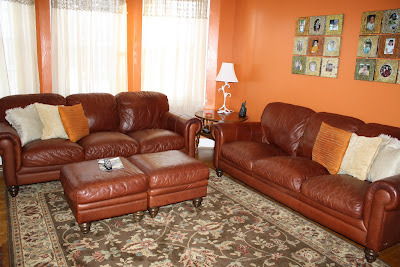 We have a brown leather chair and I tell Hubby all of the time it's time to get the matching couch because I love it so much. Good luck with whatever you do and post pics when it's done. I totally understand your plaster disaster. 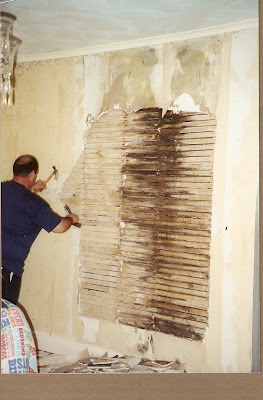 We had the same problem at our house - planned to take down the wallpaper and paint and ended up ripping down plaster to the studs!